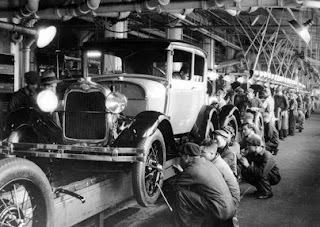 The principles of standardization, mass production, and streamlined productivity that is integral to manufacturing today can be traced to Henry Ford's invention of the Model T assembly line. This new process produced higher quality automobiles at a lower cost. As well, a more precise product was created with a decreased labour force, and with less time per unit output. The development made in pre-cut light-frame systems took advantage of this new process and technologies of production. By 1910, many companies had begun to offer prefabricated housing kits of varying scales and quality. Standardization is the limitation to the variety in product produced so that machines may be able to output set lengths, widths, and assemblies. This removes the waste associated with variability options and the margin of error in end products. Mass production operates on the idea of the economy of scale, where with higher production levels of something, the cheaper and higher quality that product can become. Ford also became extremely involved with interchangeability of automobile parts - where parts are created to be used in a number of different end products . A prime example of this way of thinking that was transferred into the housing industry is the 2 × 4. Houses may all be different, but all are built from this standardized, mass-produced part. In the Ford factory, threading for bolts became standardized allowing for easier and faster connections. Flow is the assembly line concept where complex and specialized machinery shape products which are driven on a line, where labourers perform a limited number of tasks in the operation. This repetition of task reduces time as well as the level of training required for these employees, who now instead of needing to learn a complex art of construction, they learn and become specialized at performing one very straight-forward and repeated task. This kind of rapid production became reflected in the nature of products produced via this method, as the assembly process removed much of the ornament (curvature, intricate decoration, etc.). However, with the decline of a traditional, hand-crafted appearance, a new aesthetic took its place; one which became involved with efficiency. The mass-production process transformed the order and sensibilities of society; what was produced became secondary to the actual method of production. The industrialized world understands these principles because they have become accepted standards used by manufacturers of products in many industries, including the building industry. Ryan E. Smith, Prefab Architecture: A Guide to Modular Design and Construction. Hoboken: John Wiley & Sons, Inc., 2010. US navy bases has many war tools. For this reason they can easily defeat enemies in the war. They have the best qualities and they also get many facilities from their base.